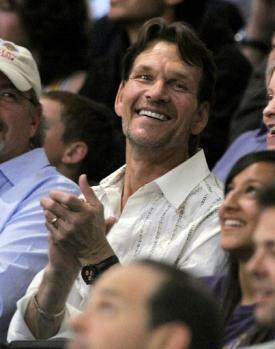 It was very nice to hear this morning that actor Patrick Swayze will be returning to TV soon. As many of you know I posted a discussion several months ago when it was revealed that he is fighting pancreatic cancer. The fatality rate for the disease is very high. I think that his doctors have been using some unconventional treatments to try and cure his condition. Whatever they're doing he looks well. I wish him all the best. Do you think they have made great strides in the treatment of pancreatic cancer? That's odd, they showed him on the Today show this morning and he looked so gaunt and unhealthy. I had heard he's still in treatment and while he's holding strong he's got a long road to haul. I didn't realize that he was coming back and that's why they put him on, I thought they just had him on to show how he was doing. He's truly not only one of my favorite actors but one of my favorite people. The way he acts in life, the way he is with his wife, all show what a wonderful man he is. I pray for his recovery daily. I know this is one of the hardest cancers to beat. The success rate in treating this disease is practically zero, hockeygal, but I think he is showing tremendous strength in the face of such a tragic event. Of course we cannot know what the outcome will be for him, mummymo, but it does speak to the will he has in fighting this dread disease. That's good to hear. I don't know anything about what the doctors have been doing but I hope that they keep doing a good job. I saw a few pictures of him and he looks so different. I hope that he is not in pain and he gets well. He is showing some signs of his illness, ayumitakashi, but that is to be expected with such a devastating disease. We are hoping for the same thing. I am not really sure about the treatments for pancreatic cancer. I am just happy to read that Patrick Swazye feels well enough to act again. His doctord must be doing something right which is a blessing. I will be glad to see him act again. He was one of my teenage crushes. Espically after seeing "Dirty Dancing". Yes, I am glad he is having more good days. I think he is loved by most everyone, Shaun, and everyone is praying for him. I am just so happy to hear that he isn't sitting back and doing nothing to work towards a recovery, gabs. The longest journey begins with a single step. Thanks for the photo, pyewacket, and though I wouldn't say that he's made a recovery, I do believe he is putting up a good fight. The fact that he is working at all is amazing considering how involved his treatments must be. I am sending positive thoughts his way and really hoping he can beat this thing. They really have made headway with the treatments..but it still remains a very grave condition and one that isn't considered curable..I am so happy that his life can return to a somewhat normal situation...He is a great dancer and I always enjoy interviews with him!! You're absolutely right, rx4life, and I think he is doing the best thing in such a situation by moving on with his life. Pancreatic cancer is one of the worst froms of cancer to get apart from bone. This is great news of him and hope all is well and the results of his treatment are good. He is one of the most finest actors and from what I see has not let his career go to his head. I loved him in Ghost and his performance was brilliant alongside Demi Moore who I also admire. I wish him the best of health and hope his fight with this cruel disease is a success. Thank-you from Aussieland for sharing this. You're right, caramello, it is one of the worst diseases out there. Hopefully, they got to it in time and Patrick's treatment will prove successful. He is a great actor and has outstanding character. Ghost was a wonderful movie, lingli! We will all be praying for his recovery. My gram passed away from that type of cancer , but they caught it much too late. I think he has the best doctirs and should be okay . I wish him nothing but the best as well. Sorry to hear about your gram, metschica, and I hope they got to his in good time. He isn't out of the woods yet, anniepa, but he is waging a battle that is admirable.And yes, it is supposed to be a series.